I’ve seen black denim that looks gray on Purl Soho’s site, so I’m sure actual gray denim must exist. This would also look nice in a medium weight twill. Betsey Johnson uses this sharkskin on her bags (and I am NOT advertising her) and I have other jackets in the past make ‘that sound’ when you rub your finger nails across it…like a durable taffeta. Good luck with the jacket! Please post more.. I miss your pattern stories and yes I have the book! Love swing coats just like this one. Good choice! I worked in the city for many years and found that during the summer, a linen swing coat worked best. During the rest of the year, it can either be wool or water-resistant, depending on the day. One thing I always had to remind myself is to sew the coat bigger than my normal size. It has to go over things, after all. And BTW, denim exists in many colors these days, and certainly in gray. Yes, there is grey denim. I found two online at Fashion Fabrics Club; I’ve shopped there. https://www.fashionfabricsclub.com/p171884_37926-medium-grey-stretch-twill and https://www.fashionfabricsclub.com/p95039_32787-medium-grey-stretch-twill which has brown undertones. Mood Fabrics may also have some. Lovely coat! I think you’ll need the longer version for an effective mass-transit seat barrier, though. If you can make a dress (and I know you can) then you can certainly make a coat. And if welt pockets scare you, then make patch pockets instead! LOVE this pattern, especially the short coat. I would love it in cream (though I’d get it filthy) or red, with a fun print lining. 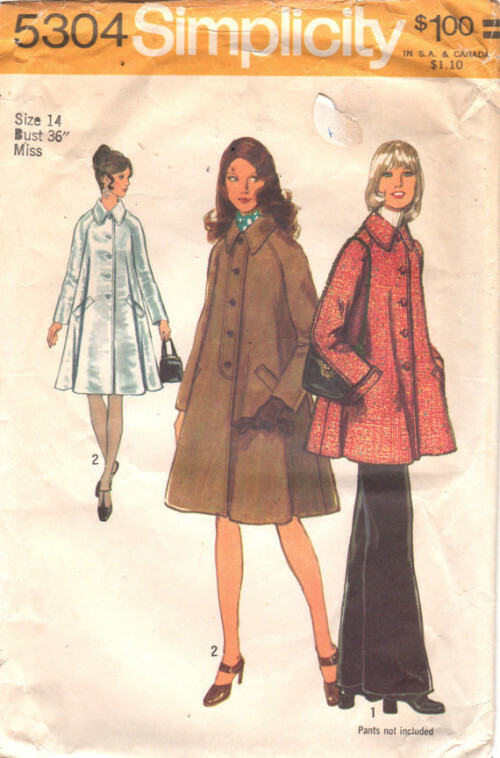 Laughing….I made a long jacket/short coat (that blouse pattern with the raglan sleeves and stand up ruffle like neck….not home to check) for a trip to SF last July/August and debated not lining but in the end did. It was a wonderful addition and I wore it under a “real coat” all winter here where we have actual weather. Nice to realize that it is a “SF Coat”. Your’s sounds great, but I would line for non-wrinkle, extra warmth, etc….. I had this very coat when I was about 17. It was in a black and white houndstooth woollen fabric and made by my aunt who was a fabulous dressmaker. Seeing the pattern brings back all kinds of memories – mostly good! I hope you love your coat as much as I did mine. have you been to Scrap yet? I think it is http://www.scrap-SF.org. They have filing cabinets full of vintage patterns for pennies plus loads of fabric, buttons etc. worth a visit! Hi! If you feel like brick and mortar shopping check out fabric discount outlet on mission by 17th right next to thrift town. It has an amazing, to me, selection of fabrics and may have a gray denim for you. My other favorite is britex, though i think you know that store. love the style of the pattern! This coat is super cute but just keep in mind that you’ve only been living here in years of RECORD DROUGHT. This year we’re going to have a more rainy winter, and actually it is normal for SF to get several months of heavy rainfall. I think you might end up wanting a waterproof coat too.